Rattlesnakes take care of their babies. Yep, they really do. But, what does “care” look like in a snake? Do they feed their young like a mother bird? Do they keep them warm? Do they protect them from predators? 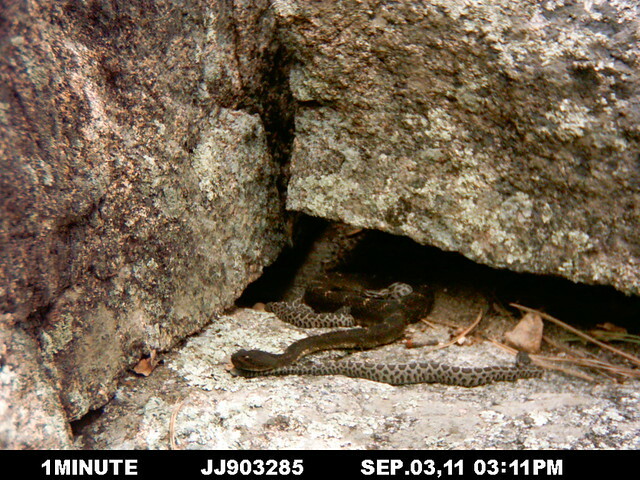 With the exception of feeding, rattlesnakes care for their offspring in familiar ways. The following is a timelapse video (taken at 1 minute intervals) that illustrates a typical day for a new rattlesnake family. 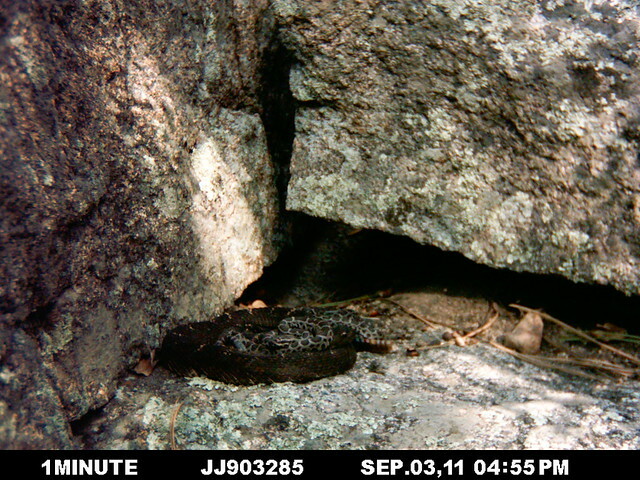 The large, black snake is Cap Mama, a female Arizona black rattlesnake that gestated with four other females and gave birth in late August to seven neonates. This video was taken when the neonates are just two or three days old. And then she looks away from the camera. We have observed this “lookout” behavior by several different females. The neonate in the foreground of this photo is starting to stray from the group and Cap Mama notices. A gentle tap from Cap Mama reminds the neonate to stay with the group. 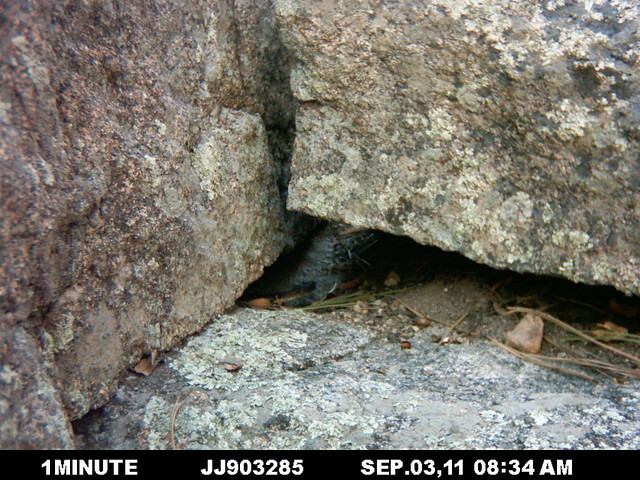 We have also observed the females blocking neonates from straying too far (see A rattlesnake helper?). The neonate responds by returning to the group and Cap Mama heads back in as well. 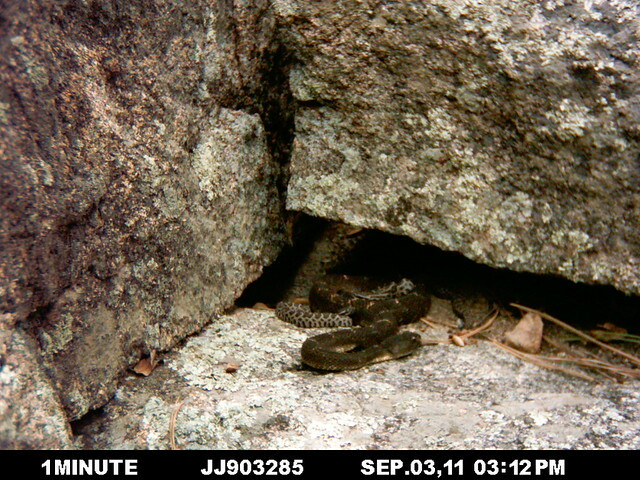 In this rattlesnake species, adults are darker than neonates and thus may be able to gain heat easier. 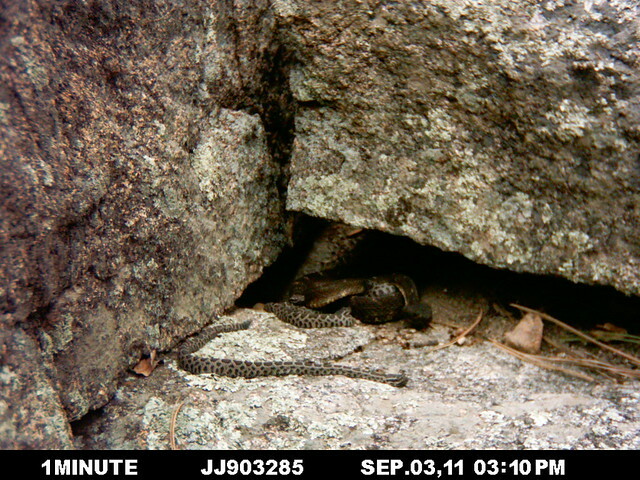 By allowing neonates to sit on and near her, Cap Mama may be provisioning her offspring with heat (rattlesnakes are ectotherms: they depend on their environment for heat instead of producing their own like we do). And Cap Mama’s larger size means she’ll garner and release heat, perhaps even into the night when the family is tucked away in their refuge. Keeping warm helps a young snake develop, shed, and get ready to leave the nest and hunt on its own.